BOCA RATON, FL (October 4, 2011) –Florida Atlantic University recently received a gift in memory of the late Barry Serota, an attorney, record producer and executive director of the Chicago-based Institute for Jewish Sound Recording. Serota was widely known for his deep knowledge of Jewish music and produced more than 100 recordings of Jewish sacred and secular music. His productions at the Institute for Jewish Sound Recording included choral, instrumental, folk and art music. 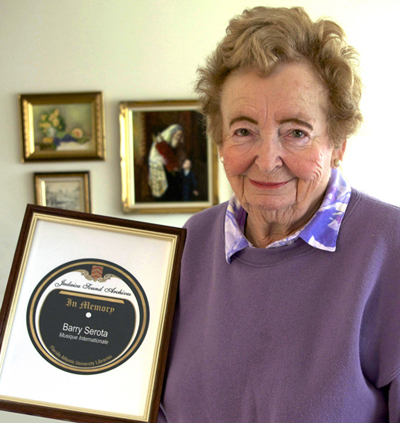 Serota’s mother, Blanche, donated 1,500 LPs, more than 700 78-rpm discs, 100 digital audio tapes and 1,443 audio reel-to-reel tapes to the Judaica Sound Archives (JSA) at FAU Libraries in honor of her son. The collection includes rare record masters and pre-production one-of-a-kind recordings. Blanche Serota became acquainted with the FAU Libraries when Ben Roth-Aroni, JSA’s sound technician, called to offer his condolences following Barry’s death. During his youth, Roth-Aroni worked for Serota as a tape editor and greatly admired his expertise in the field of Jewish music. Roth-Aroni encouraged Blanche to visit FAU Libraries, and during her February 2011 visit, she arranged to donate her son’s treasured collection to the JSA. The JSA has digitized and compiled a collection of 56 albums produced by Barry Serota. The recordings can be heard on the JSA website at Musique Internationale. I have some records to donate. Can you please tell me where to send them? You can use this link: donate recordings. It will give you all the info you need to pack and mail your recordings to FAU Libraries. For your convenience, you will also be able to print a mailing label with a click. I want to congratulate JSA on the wonderful gift from Blanche Serota. As a Chicago-based Jewish Musician, I knew Barry well and valued his knowledge of and love for Jewish Music. Barry was unique. His memory was legendary. His knowledge unbelievable. He was a character, to be sure, but a lovable, wonderful personality. A lawyer by trade, his true love was Jewish music and especially, Hazzanut. He routinely connected with everyone he knew in order to obtain knowledge and to impart information. When you picked up the phone, he continued as from where he had left off during your last conversation. He knew what a composer had for breakfast the morning he composed his Hashkivenu in g minor. He was eager to hear of your recent activities and performances. He saved many scores from oblivion by searching garbage cans. He told anecdotes which endeared us to Hazzanim and composers. I always told him he should write a book and share his knowledge of Chicago Jewish music as well as all Jewish music with the greater public. Barry was a treasure. He was taken from us all too soon. His loss is a great loss to Jewish culture. This wonderful gift of his dear mother will help to keep his name and his work alive. May his memory be for a blessing. This is a beautiful story – and thanks for the compilation of recordings! What an enduring epitaph to a life`s work. I cannot wait to go around to my Grandfather with my laptop who will be over the moon to listen to the recordings. I was unaware of the great tradition of Jewish Music. I came across the site by accident and have just done a search about it. One I came across was called Kol Haolam Kulo Sappir which sounded rather beautiful. Some of the sounds seem half remembered from somewhere else. I have been inspired to learn more. I have previously promised myself to learn to play the violin next year and would like to try some Jewish forms. I am glad to see that Barry Serota had dedicated so much to preserving this music. I am 66 years old and have been studying Rap Music which has great subtlety in parts. It cannot compare to this form of Music, but nonetheless has its own uniqueness. Thank you for this introduction to the Jewish Music Form. What a great story! I would like to donate some records as well. Where to donate them?